These Huevos Rancheros are lightened up with baked tortillas and a light and smoky sauce, and topped with a sprinkling of cheese and a dash of chipotle crema. 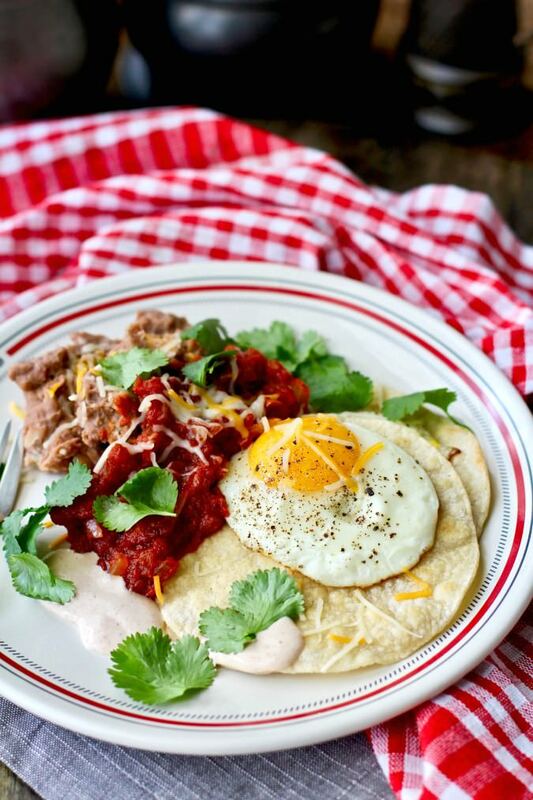 Serve these huevos rancheros with homemade vegetarian refried beans for a delicious breakfast or brunch... or dinner, because breakfast for dinner is awesome. The sauce for these huevos rancheros includes onions, crushed tomatoes, chili powder, cumin, chipotle powder, and cayenne. To make the chipotle crema, I mixed some crema (Mexican sour cream) with some Cholula chipotle hot sauce. To make the vegetarian refried beans, you begin with canned pinto beans and cook them down with some sliced onions in a mixture of olive oil and butter. If you prefer a vegan version, replace the butter with more olive oil. Whenever we go out for breakfast, I'm always drawn to the Mexican items on the menu. Give me a breakfast burrito, chilaquiles, or breakfast tacos over eggs Benedict anytime. In fact, at home when I'm making breakfast or brunch for a crowd, I always make this Mexican breakfast casserole. In fact, it's my most requested dish for breakfast potlucks at work. Along with the chipotle crema, you can serve these eggs with sliced avocado, sour cream, cilantro leaves, and extra hot sauce. Welcome to Progressive Eats, our virtual version of a Progressive Dinner Party. Each recipe in our menu this month features eggs and our host this month is Carol Borchardt at From A Chefís Kitchen. If you're unfamiliar with the concept, a progressive dinner involves going from house to house, enjoying a different course at each location. With Progressive Eats itís a virtual party. A theme is chosen each month, members share recipes suitable for a delicious meal or party, and you can hop from blog to blog to check them out. Come along and see all of these delicious dishes that feature eggs! Drain the can of beans, reserving the liquid. In a saucepan, heat the butter and oil, and add the onion. Sauté until softened and translucent, about 4 minutes. Add the beans, 1/4 cup of the liquid from the can, chili powder, salt, and pepper. Cook on medium low for 10 to 15 minutes, stirring regularly and smashing the beans against the side of the pan. The mixture should be thick. In a medium saucepan, heat the olive oil over medium heat. Add the minced onion and sauté for about 5 minutes. Add the crushed tomatoes, spices, and salt, and bring the mixture to a simmer. While the sauce simmers, brush the tortillas with olive oil and place them on a baking sheet. Bake them, 3 minutes per side, until slightly crisp. Remove them from the oven and set aside. Melt the butter in a large saucepan and fry the eggs until the whites are set. Remove them from the pan and transfer them to a plate. Add more butter and fry the rest of the eggs. Place two tortillas on each plate, and top each with an egg. Add about 1/2 cup of the sauce to the plate, along with some refried beans. Garnish with cheese and cilantro leaves and the optional chipotle crema and avocado slices. This recipe was adapted from the wonderful book, Pretty Simple Cooking: 100 Delicious Vegetarian Recipes to Make You Fall in Love with Real Food. What a beautiful dish. If these are on the menu anywhere, I order them!! Always. yours look perfect. 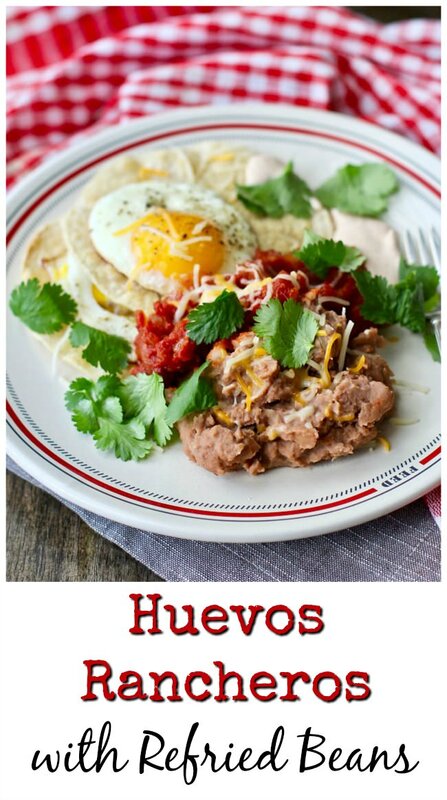 Huevos rancheros is one of my favorite meals - perfect for breakfast, brunch or dinner! Your version looks fantastic and I love that you baked the tortillas. Beautiful! There is something so homey and inviting about this dish - I want to sit right down at your table, grab a cup of coffee and dig in. You don't mind do you? Of course, I'll try them at home too, but that takes time and I want these right now! I would love to have you at my table! Huevos Rancheros was my go-to in my late 20s/early 30s for brunch. This looks incredible. And I especially love that you made the refried beans from scratch. Yum. Huevos Rancheros are my absolute favorite breakfast of ALL time. If it's on the menu, it's what I order but I've never actually made the dish myself. Trying this mouthwatering recipe now gives me a good reason to make them! We're like-minded Karen! I always look for the Mexican items, and I'm a lifelong border girl! 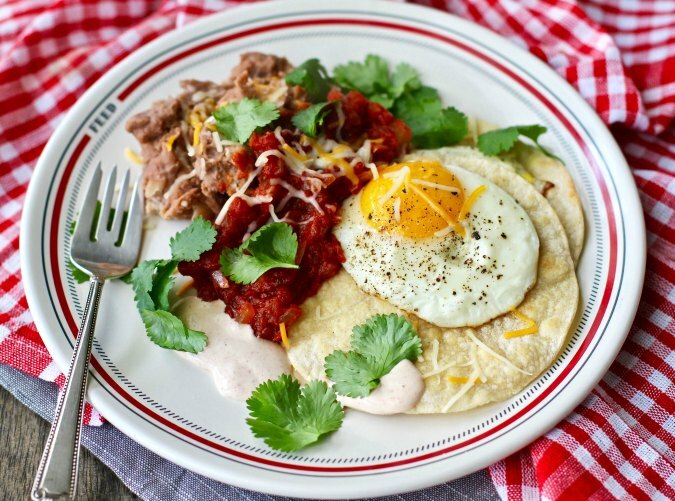 Your Huevos Rancheros look fabulous - perfect any time of day. Yum! Love Mexican breakfast! Thank you! You've made this dish seem so approachable and easy to make. This is a classic but I never think to do it at home. I will now! This is a quintessential breakfast dish in Denver and each time I order it, I am reminded of my transition from Midwest and Southern foods to the Mexican dishes so common in Denver. I avoid them for a long time but I finally took a bite or two, was won over, and have never looked back. Your version sounds Delicioso Karen! That's a wonderful story. Having grown up in Southern California and lived here all my life, Mexican food is ubiquitous. I've probably taken it for granted! I grew up in Texas eating a lot of Tex-Mex and this is a great way to start the day. I had never had this dish until just a few years ago. A cafe near where we used to live served it, and I often went there just for this dish. LOVE the spicy tomatoes you have with it!